My friend recently posted on Facebook about pre-Christmas tradition in her area of Southern France, Tarare. On December 8th, homes around her region are lit up with candles on windowsills and balconies. Then families walk around at night to view their neighbors' homes, see street performances, and share some hot mulled wine. She and her kids lit 67 candles around their house. I bet you're thinking all of France is like that, and all our holiday customs here in Paris are so old-world, so charming, so authentic. So. Let me take you on the school field trip I help chaperone to the mairie (City Hall) of the 5th arrondissement. As we approach the building, there is a small, temporary forest of Christmas trees, each decorated with foil bows. There's no nod to secularization, no Menorah, no religion-free and generic "Happy Holidays" written as a greeting. It's just pure Christmas. So far, so quaint. Then we go inside for the show, held in a huge reception room with its combination of mid-19th century and also 1930s art deco grand chandeliers, murals, moldings, columns, wrought-iron balconies, and parquet floors. So evocative of eras gone by. The lights dim, and the music comes up. We are blasted with the pop rock sock "All Star" by Smash Mouth. As the only native English-speaking adult in the room, I am probably the only one able to mouth along with the lyrics "Somebody once told me the world is gonna roll me, I ain't the sharpest tool in the shed. She was looking kind of dumb with her finger and her thumb, In the shape of an 'L' on her forehead." Lovely holiday sentiment indeed. The show itself shatters my preconceived notions of a city-hall holiday spectacle. A colorfully-clad woman gets up on stage and takes a minute to set up the premise that there is a genie locked in a box who is afraid of the dark. She booms into the microphone, "And the only way to help him is to sing songs from Walt Disney." She then cheerleads, "Do you know your Disney?! Can you help?" And, as advertised, the show is -- 100% -- about quizzing the children on their knowledge of Disney movies, characters, and songs. Children are brought up on stage and asked in which movie can be found "Hakuna Matata" (the Lion King), or to repeat and identify the source of "supercalifragilistic-expialidocious" (Mary Poppins), or to name the Seven Dwarfs from Snow White. Oddly, she quizzes them on a song from Anastasia, yet never once mentions the Little Mermaid. Well, at least I learn something. Namely, that the dwarfs are called in French: Atchoum (Sneezy) Grincheux (Grumpy), Dormeur (Sleepy), Timide (Bashful), Joyeux (Happy), Simplet (Dopey), and Prof (Doc, evidently having changed professions). Then she says something to the boy I don't catch, and the little boy adds, "Calixte". At first I think the French have an 8th Seven Dwarf I don't know about, but it turns out she has asked the boy for his own name. Still, he is very, very small. Even in English, Pippa knows very few of these references, and she certainly doesn't know them in French. But she, and all the kids, enjoy screaming answers back to the stage and, of course, in the spirit of all field trips, avoiding any real school work. I am a bit baffled, though, and turn to one of the teachers to ask, "Was this sponsered by Disney, by any chance?" She laughs, as if I've made a good joke, but my question is sincerely meant. I'm not sure I would expect this kind of crass commercialism even in the US, except (naturally) at Disneyland itself. Or the mall. And so, as the lights come back up in the audience, I leave you with this heartfelt holiday wish, as we are sung out of the mairie, again by Smash Mouth: "Hey now you're an All Star get your game on, go play. Hey now you're a Rock Star get the show on get paid. And all that glitters is gold. Only shooting stars break the mold." 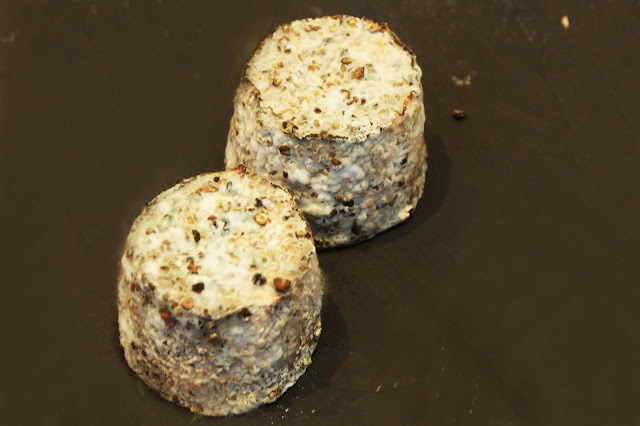 Le Chardin au Poivre is a little nugget of a raw goats' milk cheese from Poitou-Charentes (now formally part of the newly created Nouvelle Aquitaine region), that bastion of all that is right and wonderful about goat cheeses. The cheese was created in the 1980s, and comes in both plain and peppered varieties. Either way, they are aged for a minimum of 8 days, then often spend a few more in the store waiting, which thickens the mold and crust and intensifies the flavor. It ends up laced with gorgeous gray, black, red, brown, white, and even a tinge of green molds. It's a perfect little goat cheese that fits in the palm of your hand, but even better in your mouth. There are great hazelnut, grass, and goaty notes in the Chardin itself and, of course, a great peppery (poivre) kick in the pants. Le Chardin au Poivre looks like a little Christmas tree, complete with gorgeous multi-colored molds that cover it like tinsel on a tree, and little peppercorn ornaments. Nothing I could have chosen to go along with this post would have been as cheesy as the Christmas show itself.